1. That's so cool that you are making soap! I used to make soap to sell too. Best of luck at the craft fair. 2. 2000 followers? Congratulations! What a fantastic landmark. I know you've been working pretty hard to make that happen. 3.Sorry, I'm a technological newbie. I just figured out how to add a pin it button to my blog last night. So, I'm a bit slow. ;-)Wish I could help. I always enjoy your Friday 5. And congratulations again on 2000 readers! Pierce is always thinking, even I never thought of a toenail fairy. I love the idea of a toe nail fairy. I think there is a plugin for recipes on Wordpress. I don't know about Blogger. Congrats to Lisa S and yes she has beautiful jewelry. Wow 2000 congrats on that that is a feat in itself. I'm bad with crafting.. maybe not the crafting is the problem, I guess I'm just lazy. The only time I feel like making stuff is for Christmas. i love your Happy Cows. too cute!! Who are you kidding? I have seen you wear those Fitflops in winter. I think the toenail fairy could come and leave a joke prize. 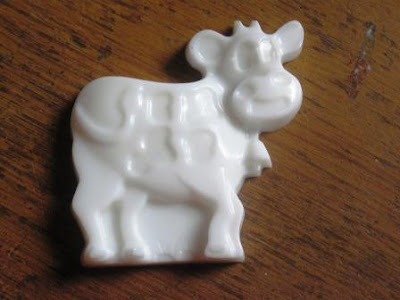 I want some cow soap. Save me a couple please. Cutie Soap. . . . I will - very soon - require one caramel apple - I think the inner call for one caramel apple came from my Great Grand Mother - she was full of Life, unique and quirky. Still, it is an inner need - once a year - makes Fall official. I like the way the air feels. I like sweaters, I like school, I like getting ready for staying-in projects. And - All Year - I Like You. What do I love about Fall? Almost everything! Pumpkins, cool weather, jeans, boots and fleece. Sweating less on rides. Fall colors on the trees. Walnuts and pecans on the ground for free. Rain. Pierce has a black toenail just like I did! :) mine has nearly grown out now. That soap is super cute! Strange: I was just reading Buttons comment on cows and turkeys, and here you're writing about cows. Congratulations on reaching the 2,000 followers mark. I thoroughly enjoy the autumn colours (though I miss the red leaves of the east). The nights are cool, so I throw an extra blanket on the bed. Maybe I love the fall so much because what's when I was born, so many years ago. toenail fairy...too cute! congrats on 2000!!! woo hoo! and congrats to lisas!!! we had rain this morning. blessed, desperately-needed rain! that's what i like about autumn! Your cow soap is so cute! And I bet it smells good, too. I've been thinking of making soap for my own use. But I see that I need to visit your Etsy store, too! Congratulations on over 2,000 followers! That is awesome. I would love to be able to print our recipes on cards. I'm going to have to look for a way to do that. I have everything on regular computer sheets. I've never thought of a toenail fairy, I hope she stops by! 2000+ congratulations. I adore your soaps, Lisa. That is so cute about Pierce and the toenail fairy! I hope all of you enjoy the upcoming weekend. Aww, the happy cows are so cute! And congrats on reaching 2k followers - that's awesome! 2000 wow, ongrats to you! The soap is adorable! What happened to Pierce's toenail, did he injure it? Fall is gorgeous, I LOVE the flaming leaves! But I do NOT like the coming of the dark and the cold. I just don't like winter anymore at all now that I am old! I congratulate you on 2000 followers! 2000 followers? Congratulations and good for you!!!! Cow soap .... so dang cute! Fall is my favorite season.....the only thing I dislike about it is that Old Man Winter is right behind it. Not that I mind the cold ... I am just not a fan of snow! The best thing about fall is leaving the brutal temps behind! Next, I love the crisp air and the leaves changing color. My favorite time of the year. Congratulations on the 2000 followers. If you figure out the recipe print thing I would love to know. I am totally ready for fall but not the pending winter. I thought about making soap before but so far haven't done it. Maybe one day. I wish you luck finding a good craft fair. Congratulations on 2,000 blog followers. WOW! Your cow soap is cute. I like crisp fall mornings, although this mornings 39* was a little chilly. I like the way fall warms up to just the right afternoon temperature. The changing fall colors and flavors are also fun. Fires in the fire place and wood stove. The leaf season is spectacular. It's the best time for walking in the woods. Too many tourists and bicyclists. Congratulations on the 2000 followers and that is the cutest cow soap! The happy cow is adorable! And let us know if there turns out to be a toenail fairy. Love the homemade cow-soap. That is udderly terrific! Print Friendly? Something like that. I know there has to be a few out there. Love your soap and congrats on the 2000th follower -- that's awesome! I think I'll be 80 when I reach that number. Lol! Love the sweet cow soap! Congratulations on 2000 followers! I used to do recipes. And wondered myself about easy downloads. I bet wordpress would be better than blogger that way. And congrats on 2,000 followers! How do you do it? I don't get many followers. And I don't know why. Fall is a long way off for us, but it is my favorite time of year! Our electric bill goes down a bit$$. I'm back now! I was away...trying to keep my job as a teacher. Be careful - that crafting bug is a hard one to eradicate! Seriously though, I am happy for you and think you will have a great time. Take the kids with you, they can be excellent salespersons. I don't know how to embed PDF's, but here's a website link that shows how. http://www.mybloggerlab.com/2013/03/how-to-embed-pdf-and-other-documents-in-blogger-posts.html I'd have to mess with it for awhile before I could figure it out. I would think you could do it through a lot of outside photo sites like flicker or photobucket. Those sites, if they were smart should have code you can copy and paste into blogger HTML. ADORABLE soap. Hope your kid's toe heals up fast. What a bummer. I had a toenail like that once and it decided it wanted to part ways with me the night before I was taking a trip to Florida. Uh, NO WAY, Toenail---I superglued that sucker back on and painted it with nail polish. We had a lovely last trip together.